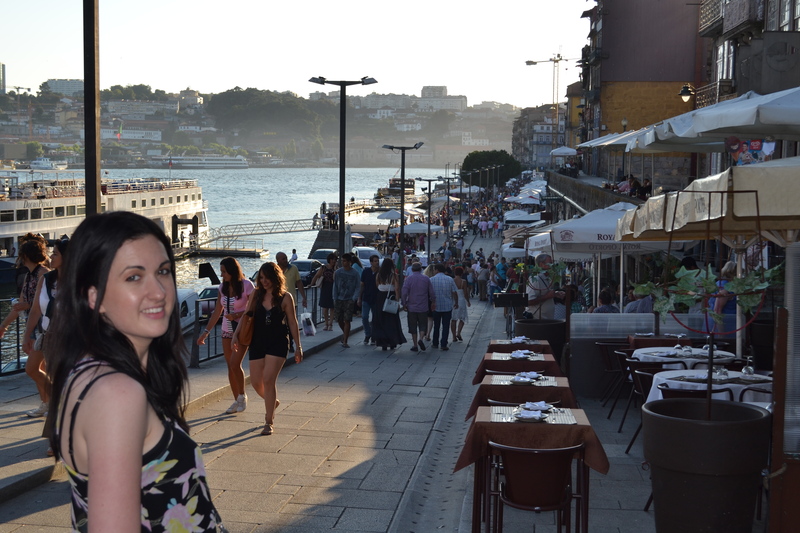 We had both heard some fond stories of Porto before leaving New Zealand (at times a little hazy, which will be explained later), so we were both pretty excited to arrive. Car parked and checked into our room, we headed straight back out to see the city. 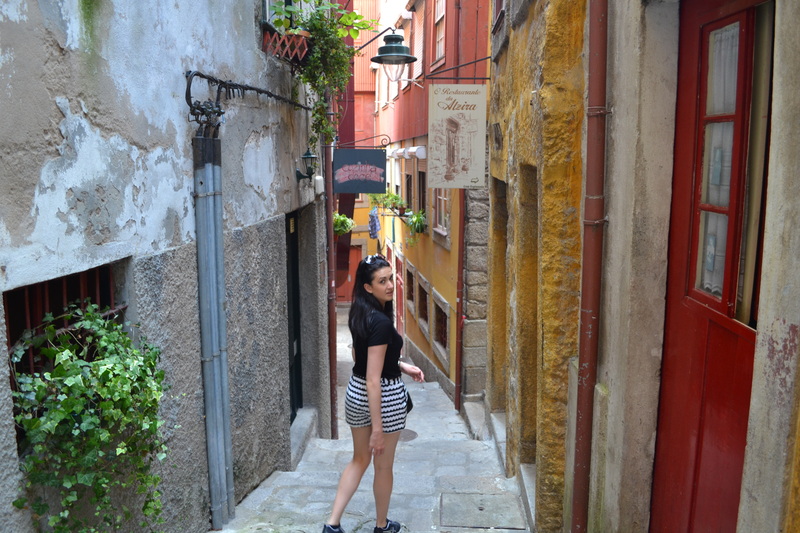 After a stroll down a buzzy main pedestrian street, we found a steep flight of stairs heading down towards the river which we decided to follow. 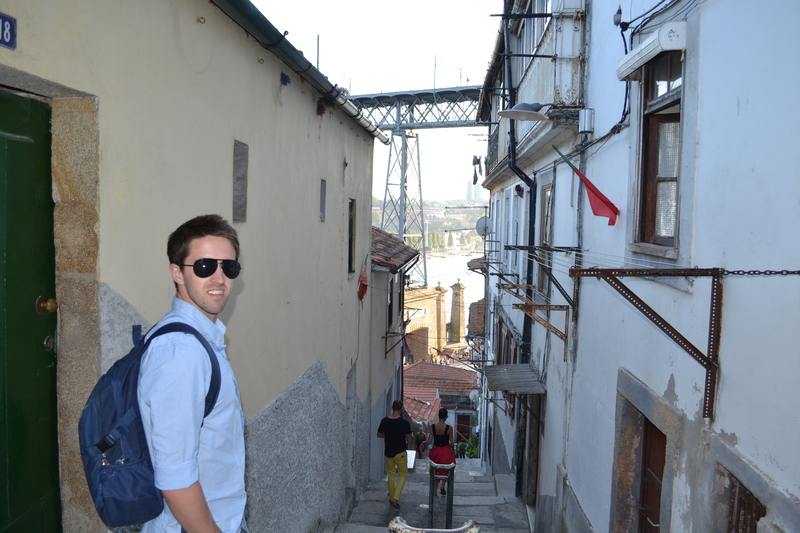 I don’t think this was part of the main tourist trail, but it was a cool experience: the whole way down little houses opened up directly onto the stairs, as it was the end of the day all the locals were coming out to meet on the landings. All seemed to be sharing tiny home-made BBQs, the men to roast meat and the women to roast peppers, and the smells were starting to make us hungry by the time we reached the river. 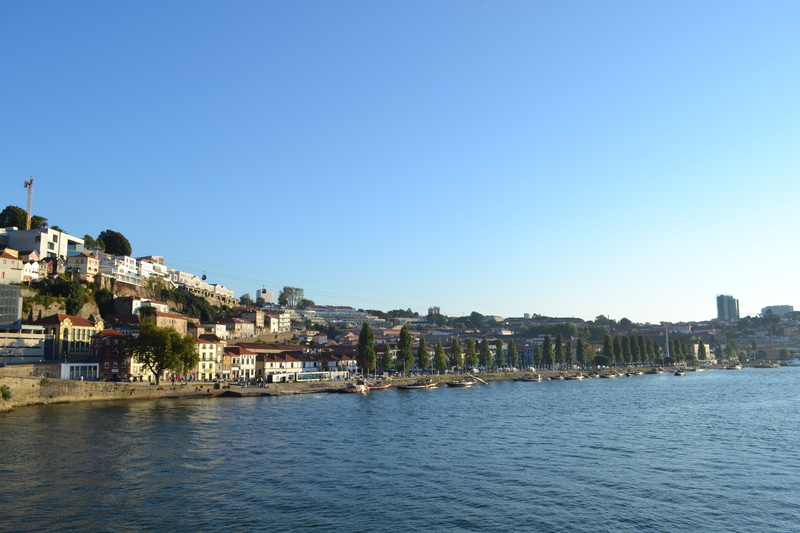 Our first good views of the old town didn’t disappoint – Porto is definitely a very pretty city, especially in the last hour or so of daylight as we caught it. Dinner was off a fairly local menu. Bridge had a seafood pasta, and I tried something called a ‘francesinha’ – this was a double-stacked sandwich filled with ham, smoked pork sausage, fresh pork sausage, and roast meat, covered with an egg and a heap of cheese, and then covered in a sauce made of beer, tomato and some more meat. Portions are huge in Portugal (Bridget’s pasta alone would have been enough for both of us. We found out later that you can, and probably should, order most things in half-size portions in Portugal), and while it was delicious we both felt more than a little heavy as we climbed back up the hundreds of stairs on our way home that night. The weather was perfect again the next morning, and we made the most of it by climbing the hill on the south side of the river. From the top you get perfect views back over the city and up the river. One of the things we noticed on our walk was that many of the old houses in the central city were on the verge of being derelict, and often looked as though they were about to fall down. 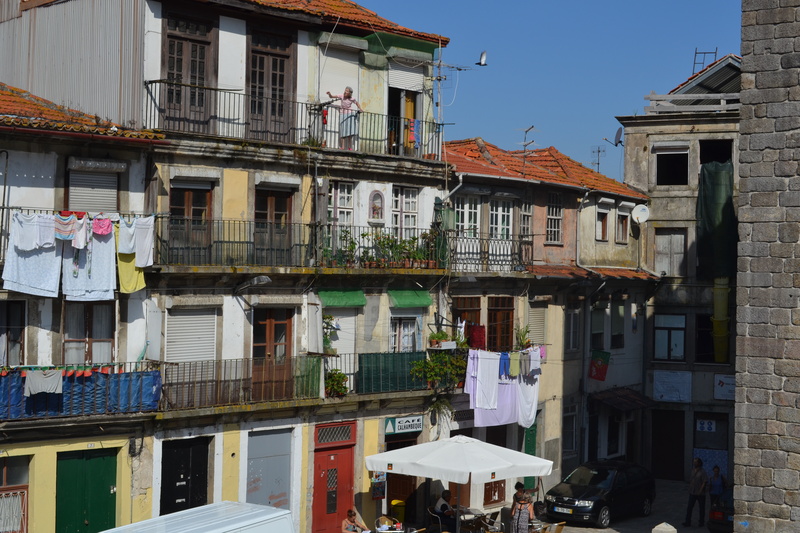 We found later this was a common problem in Portuguese cities: rent control and anti-eviction laws, sometimes centuries-old, mean that many tenants pay next to nothing, which means in turn that landlords have no possible way of keeping up with maintenance costs on the old buildings. 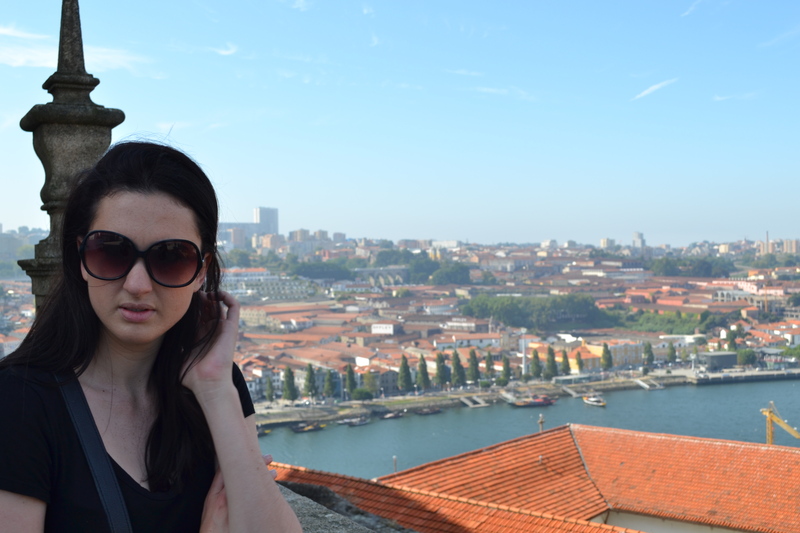 It seems a shame for the buildings, but on the other hand keeps the inner city accessible for almost anyone, and in particular the older residents, which keeps the culture of the Porto old town feeling very authentically rustic. 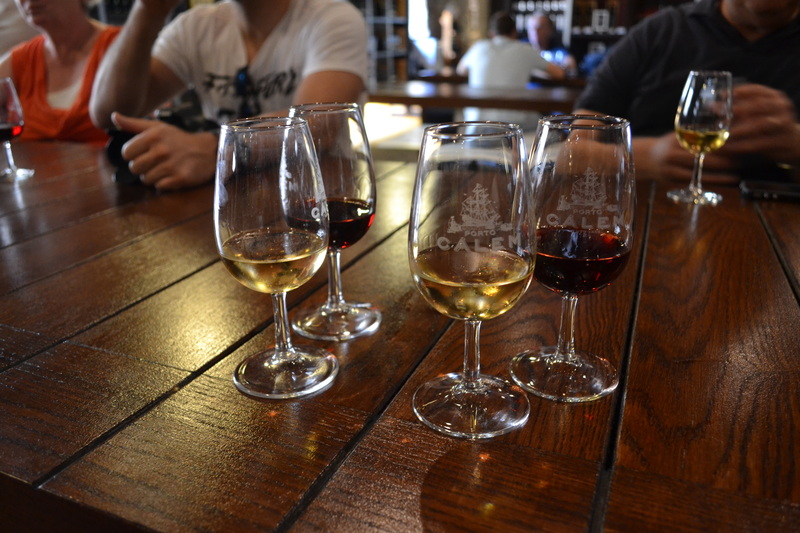 In the afternoon we had one of the experiences for which Porto is famous – a tasting and tour at one of the port caves (the ‘caves’ are actually old warehouse cellars down on the banks of the river, although this makes them no less impressive). We chose Calem as our first stop, by virtue of being the first one we came across. A tour of a cave takes about half an hour and costs only 4 or 5 euro, which is an absolute bargain considering that as well as a great little insight into the history of port wine and the heritage of the individual cellar, you also get two reasonably sized glasses of port (each) included at the end in the tasting halls. I found the life of the barrels themselves quite fascinating: after being built, the oak barrels are first used to make table wine for a couple of years. 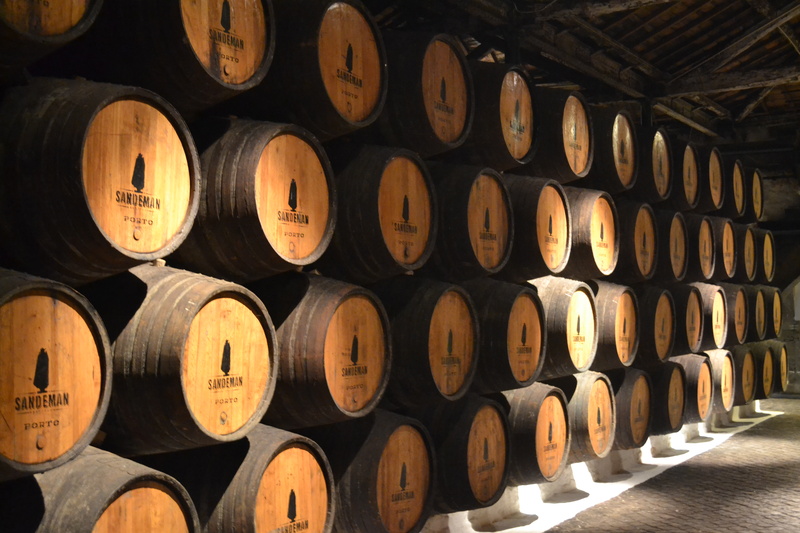 After this, a barrel will have 50 or 60 years of service making port, whereupon they are finally sold to breweries in Scotland to be used in whiskey production. For me, this made walking amongst all the barrels stacked floor to ceiling all the more interesting, as it highlighted just long-term the whole process really is. 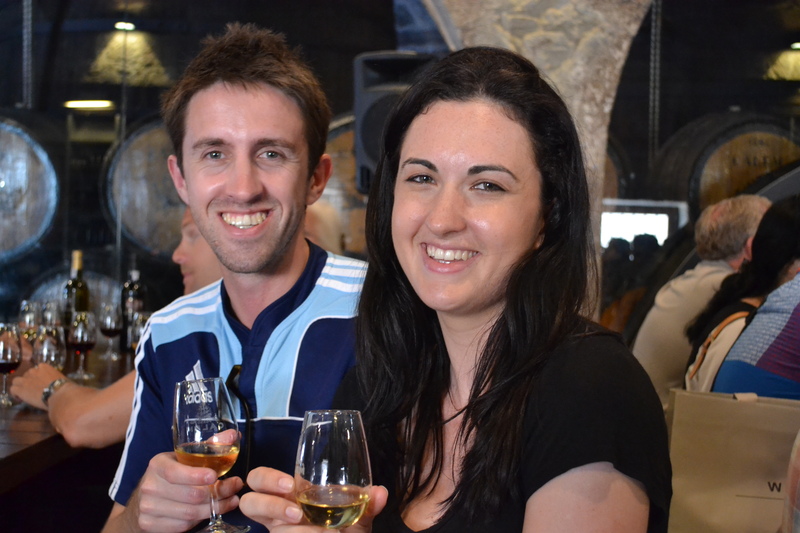 We both enjoyed it all so much that when we finished our Calem tour we walked along the street a couple hundred meters and straight into a second tour, at Sandeman caves. 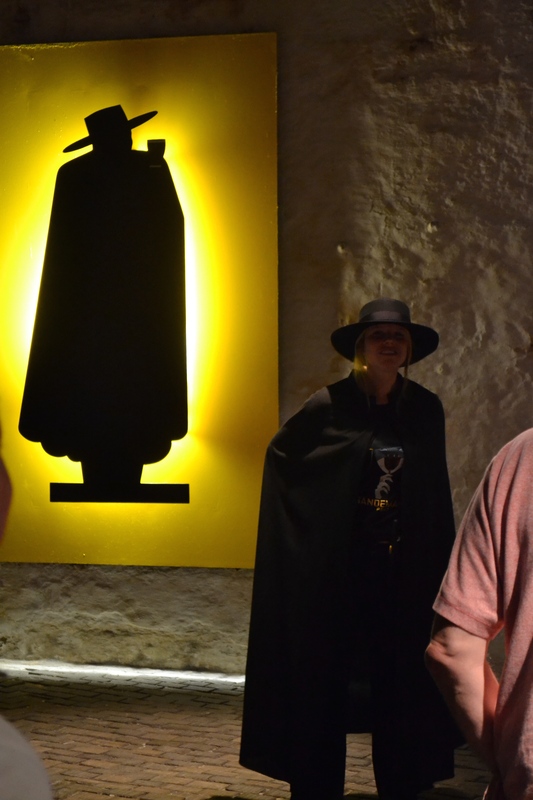 Sandeman was a bit more commercial than Calem, but cool in that while the tour was essentially the same as before, all the guides at Sandeman were dressed exactly like Zorro. 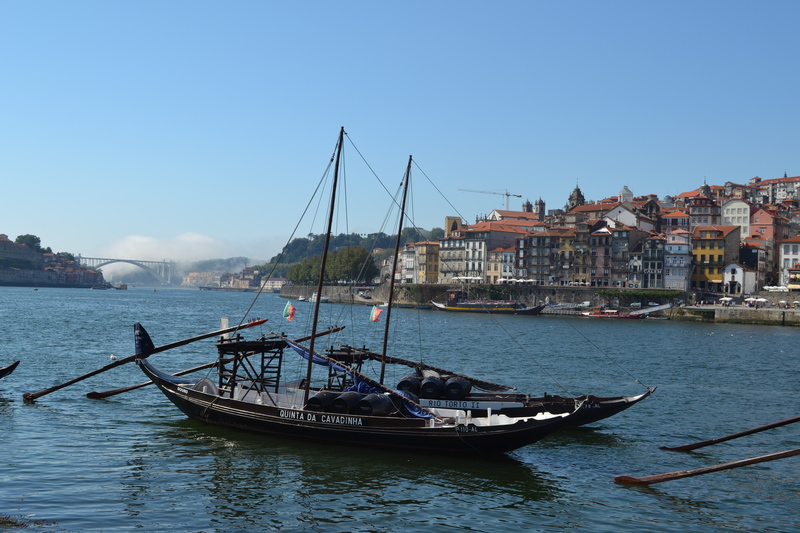 After a couple more glasses, and with a better understanding of why so many memories of Porto are both fond and a little foggy, we headed home to get some rest for our travels the next day. At least walking back up all the steps would have worked off most of the humungous sandwich! 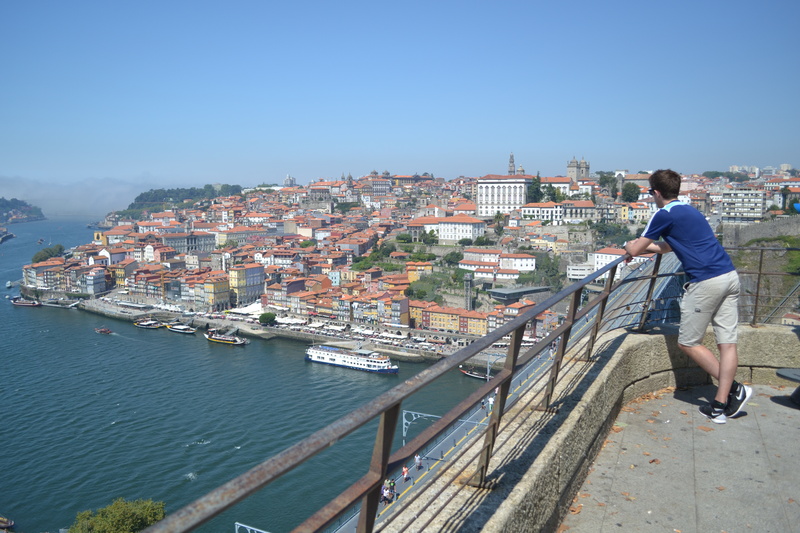 Great post, Alex; must put Porto on our itinerary when we come over.